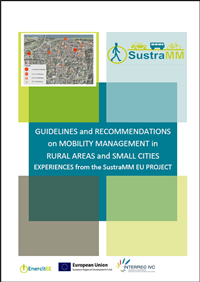 in English "Guidelines and recommendations on mobility management in rural areas and small cities"
in Deutsch "Richtlinien und Empfehlungen für Mobilitätsmanagement ..."
in French "Lignes directrice et recommendations pour le management de la mobilité ..."
in Swedish "Mobility Management ... - Riktlinjer och Rekommendationer"
in English "Mobility Management in the SustraMM regions"
in Deutsch "Mobilitätsmanagement der SustraMM-Regionen"
in French "La Gestion de la mobilité dans les régions du projet SustraMM"
in Swedish "Mobility Management från regionerna i SustraMM"
The document deals with general information on commuting, describes effets on commuting (from the point of view of the commute off region), summarises (potential) advantages and disadvantages of the commuting and presents cross border examples of commuting in Europe. 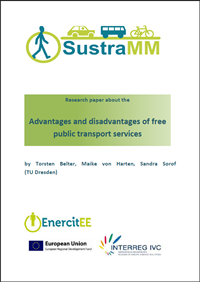 in English "Advantages and disadvantages of free public transport services"
This paper discusses different aspects, especially the advantages and disadvantages of free public transport for different target groups such as the public transport user, community, local authority, public transport operator. In addition, good practice examples are highlighted. 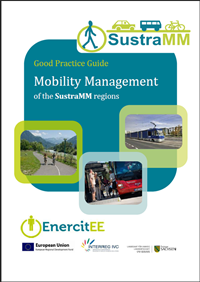 SUSTRAMM addressed the dramatic environmental, social and economical consequences of our energy hungry lifestyles by supporting local and regional authorities to reach EU Energy and Climate Package targets within the sustainable transportation and Mobility Management (MM) fields. SUSTRAMM aimed at encouraging changes in attitudes and behaviour. SUSTRAMM led to a better exchange of experience within each region as well as between the regions, e.g. thanks to reinforced networks of stakeholders and decision-makers on the topic of MM. Key actors were trained in MM to improve the understanding and inclusion of soft measures actions within transport strategies. 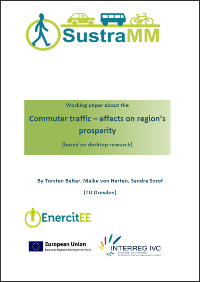 The produced guidelines and recommendations on Mobility Management will impact transport planning locally and regionally. As a result, Mobility Management strategies and measures were better and more often implemented and Mobility Management networks reinforced. 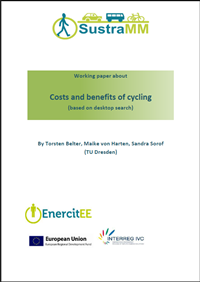 The long term impact of SUSTRAMM is to reach more sustainable and energy efficient transport systems. To obtain more information about SUSTRAMM on the ESS website, click here.